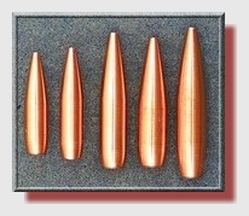 GS Custom manufactures 4 different bullet styles. HV Bullets for normal hunting applications to 500 metres. 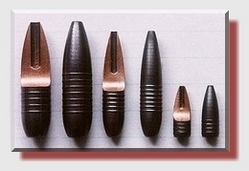 There are some HV Bullets that are designed for hunting at longer ranges and they are clearly described in the technical data where this is applicable. HV Bullets are drive band bullets and can be fired at higher speeds than smooth or grooved bullets of the same weight, without exceeding standard pressure levels. Barrel wear is reduced and external, as well as terminal ballistics are improved. Use HV bullets when a tough bullet with guaranteed expansion is required. HV bullets expand reliably from 1500/1600fps. FN Bullets are intended for dangerous game where deep, linear penetration is essential. Other applications would be for birds or very small animals where any expanding bullet would result in unacceptable damage to the cape. 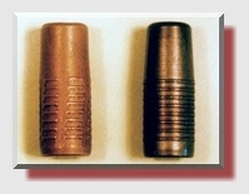 FN Bullets are also manufactured with drive bands and are safe to use in any double rifle, modern or old. SP Bullets are target and tactical bullets. All SP bullets are made with drive bands for reduced wear and reduced heat build up. 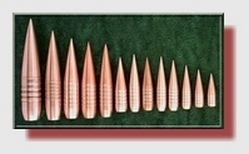 SP Bullets are perfectly concentric and uniformity from batch to batch is guaranteed. SP Bullets are application specific and attention must be given to the technical data that is available for every bullet in the SP Bullet section. HP Bullets are standard velocity, smooth, monometal bullets for hunting to 500 metres. This is the original bullet style manufactured by GS Custom dating back to 1993. The range is being re-designed with the experience GSC has gained since 1993. New HP Bullets feature a wide window of application and rock solid terminal performance, with expansion from as low as 1600fps impact speed. HP bullets are amongst the lowest priced premium bullets - an economical alternative.